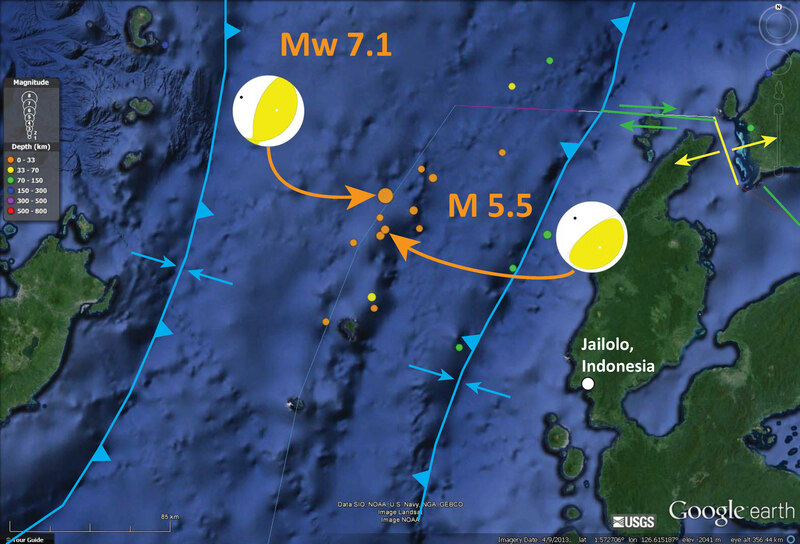 There was a Mw 7.1 thrust earthquake along the Halmahera Arc (a subduction zone) in the Molucca Sea, Indonesia. Here is the USGS web page for this earthquake. There was a small amplitude tsunami observed in the region of the earthquake: 9 cm at Jailolo, Indonesia (see map below). There was a M 7.5 earthquake to the south of this 2014/11/15 earthquake, also a thrust earthquake here is the USGS page. This is a map that shows the epicenters on a global scale map. This map shows the epicenters on a regional scale map. This is the regional map with Modified Mercalli [shaking] Intensity Contours. Here is a map I put together that shows the moment tensors for the largest magnitude earthquake and the largest magnitude aftershock. The plate boundaries have relative plate motion vectors. 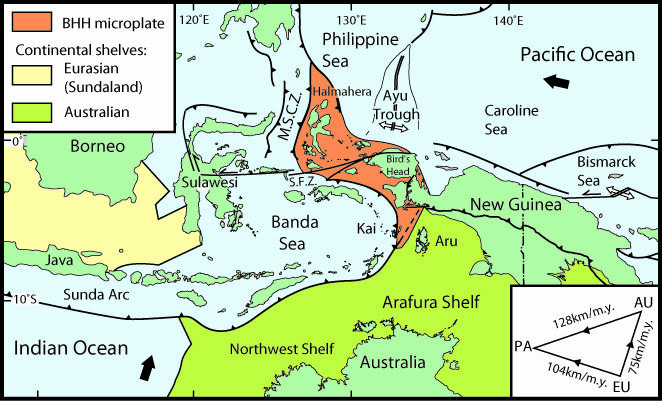 This is a region where there are two opposing ocean-ocean subduction zones. I edited this map since the plate boundaries plotted by USGS are in the incorrect location (the thin lines). This earthquake was not located too close to land (i.e. people), so the probability of damage to people and their infrastructure was low (as evidenced by the pager report shown here). 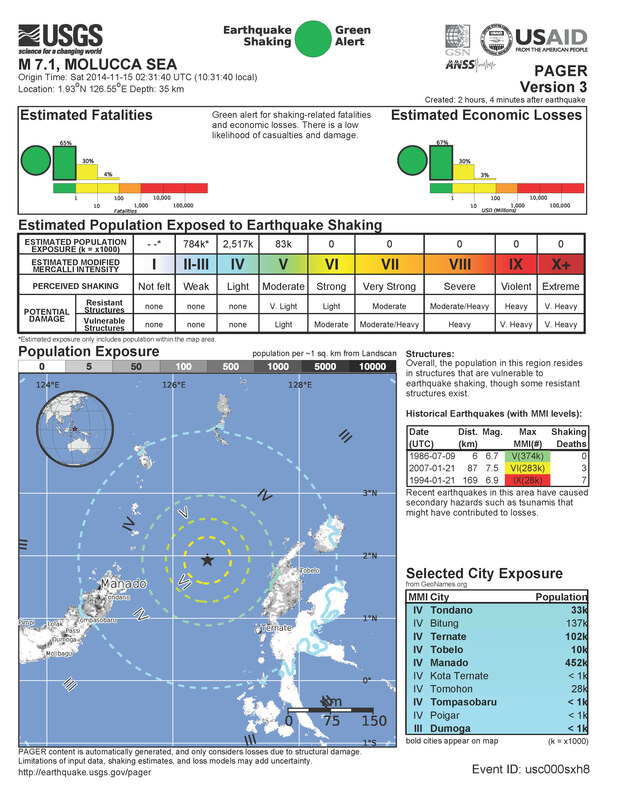 This can be downloaded from the USGS web page for this earthquake. While the above maps of shaking intensity (MMI) are generated using models of ground shaking (GMPEs), this map shows the shaking intensity based upon peoples’ direct observations. This plot shows the attenuation of ground motion with distance from the epicenter. The Ground Motion Prediction Equation (GMPE) models are plotted in orange and green. The orange model is based upon ground motion attenuation relations for the western US. The green model is based on relations for the eastern US. 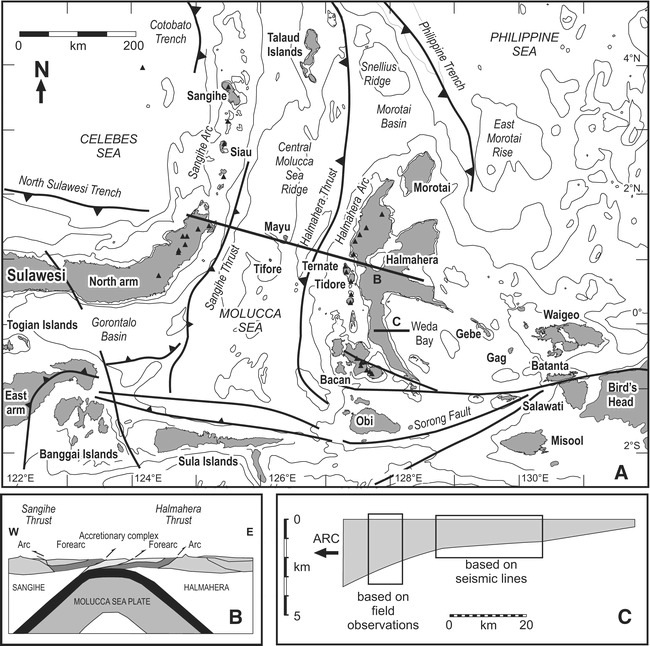 The western US is mostly accreted terrain, so this model matches the observational data (plotted as dots) probably because the Halmahera region is also composed of accreted terrain (albeit different from the western US).